Blog Home | Get in the Holiday Spirit with Family Pajamas! Create Memories with Family Pajamas! Open a family photo album from times gone by and you’re bound to find photos of the children wearing matching Christmas pajamas. The PJs were often the first gift they could open on Christmas Eve. The kids were delighted to open a present, and Moms rationalized the indulgence as being practical. In today’s age of social media, the whole family is getting in on the act with everyone wearing matching holiday pajamas. Some take it a step further with photo shoots before the holiday that allows them to feature comfy, cozy and cute pajamas for their Christmas cards and on their social media pages. We hear from customers with a traditional style who love to give the gift of Lanz nightgowns for women and girls in their families. 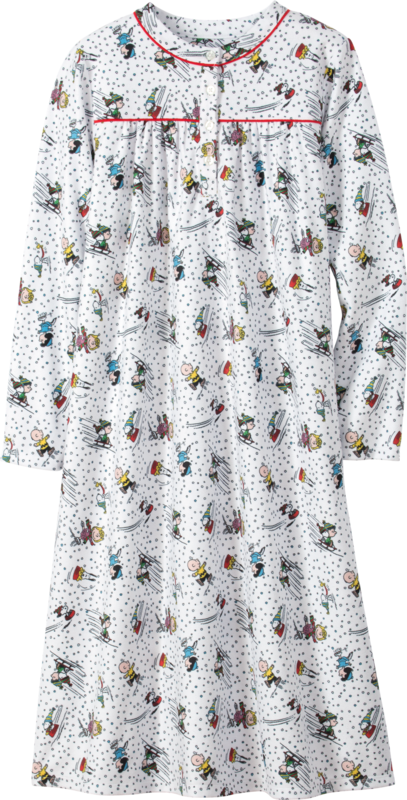 Those with a sense of whimsy tell us they prefer Peanuts pajamas. If you’re thinking about getting in on the fun with your family this year, there is still time! Here are a few tips for the best family Christmas pajamas for everyone. This just might be the start of a new Christmas tradition! First, it’s important to decide how you want the fun of family pajamas to be part of your holiday. Although many people run with the idea for the photo opportunities it creates, you can do it just for fun and make photos less of a focus, especially for those who are camera shy. 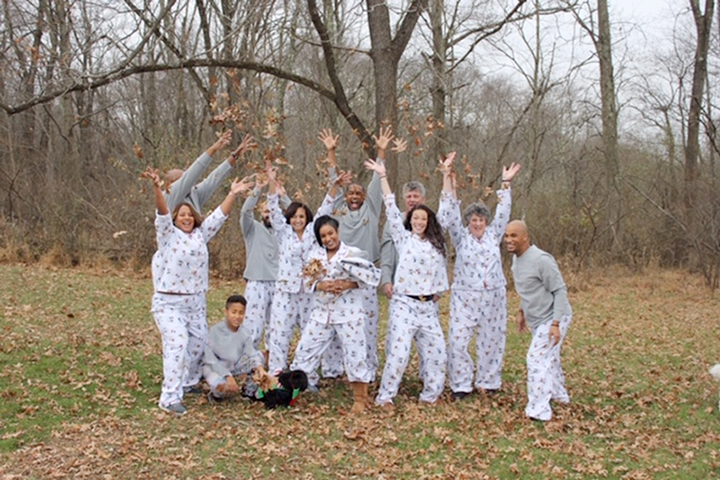 The Brown/Engelberger family looks sharp wearing Peanuts Snow Fun pajamas. There are pajama styles for everyone and in every price range. Consider which colors, prints, fabrics and cuts best match your family’s personal taste. From cozy flannel pajamas to comfy cotton, there are endless options for holiday themes and traditional pajamas for people of all ages. Remember everyone’s pajamas don’t have to match. For example, you can choose complementary styles for men and women, or young and old. Be sure to note everyone’s size, which is critical for shopping! If you do want photos for holiday greetings or other needs before Christmas, be sure to plan dates in advance, and leave enough time for shopping and shipping (if you’re ordering by phone or online). Decided in advance who will be the photographer and the camera you’re using. There is nothing wrong with snapping your pics on a smartphone, but make sure to have the help of someone who doesn’t have to be in the photos! Make the time spent in your PJs fun for everyone involved, whether it’s a planned photo shoot or Christmas morning. 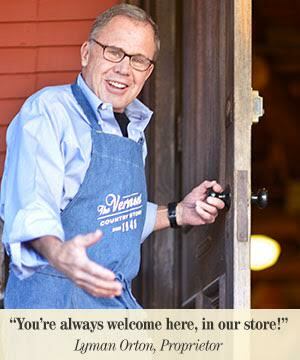 An enjoyable experience is why you’re doing this in the first place! Posted in Holidays, Seasonal Activities.